The chain link fences in the work of Paul Anthony Smith are a direct reference to the intent to posses and to dominate. The formal beauty of the presentation only underscores the clarity of the message – there is a danger in trespassing or any other attempt to usurp part of a “claimed” space. Similarly the traffic signs in the work of Filipe Cortez deal with places we are forbidden to access and the ease and simplicity by which the movements of urban residents can be manipulated and controlled. The city environment can be harsh and defensive; implements both physical and legal are created to guard the possession of space. These real and imagined tools are referenced in the work of Lan Tuazon. Her series Parking Lot Landscapes (2010) addresses control through property. Public or private parking spaces are some of the prime possessions in the city’s structure and as such are also an embodiment of ownership and nascent strife. Nowhere is power expressed more acutely than in the equestrian sculptures serving as the symbolic apex of public spaces worldwide. However the mighty ones, and their monuments, are frequently subverted by the course of events, as in the case of the ill-fated gilt-lead sculpture of George III on horseback at Bowling Green in downtown Manhattan. In the work of William Corwin, Poor Dead King (2017), it becomes a parable of such fate. Curiosity may have doomed the feline, but servitude killed the dog. Chained in the entryway of Pompeii home when Vesuvius erupted in 79 AD, a dog struggled and ultimately asphyxiated under layers of fine ash that in turn perfectly preserved shape of its body. As the organic material disintegrated, the form became a mold that allowed Allan McCollum’s cast The Dog From Pompeii, 1990/91. The work epitomizes the devastation of a cataclysmic disaster in an urban environment. Several artists reinterpret classical and pre-modern art tropes. Carin Riley’s Caryatid WallDrawings (2017) reference the sculptures of female figures used in classical Greek architecture as structural support. The support can read not only as architectural, but in a larger sense it also functions as a metaphor of female importance in Ancient Greece. 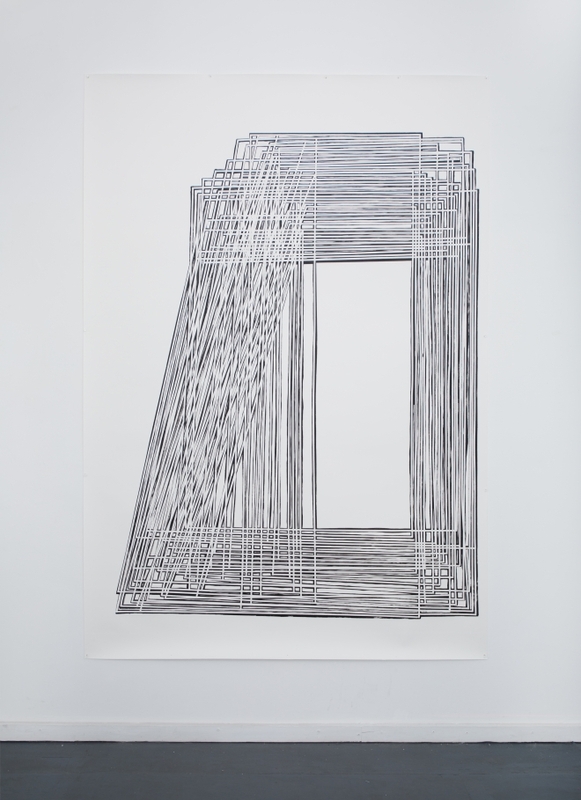 Similarly the interest in classical themes of balance and symmetry informs Reverb No.13(2013) by Kara Rooney. Her pieces, often guided by interest in history, linguistics and literature, can also be confrontational in the complexity of meaning and competition for viewers’ space. David Goodman’s Monolith (2017) deals with properties of painting as well as sculpture and with a scale that reaches architectural proportions. It claims space in way analogous to a monumental entryway and engages the concept of the triumphal arch and/or the gateway. In her large drawings Frauke Schlitz investigates the phenomena of architecture and topography and the relationships that develop while we perceive, or mentally navigate, through the man-made spaces. Lauren Clay, like Goodman and Schlitz, engages with architecture. She generates surrogate surfaces by enlarging marbleized pigment patterns and laminating them onto existing walls and architectural details. These are transformed into panoramic vistas full of twists and turns of an almost psychedelic nature. This exhibition, and the accompanying publication, would not have been possible without the extraordinarily generous cooperation of William Corwin during all stages of this project. Thank you for sharing excellent insights and the time devoted to the various aspects of this exhibition. William Pangburn, director of the Anya and Andrew Shiva Gallery, responded with great amounts of patience to many special requests. I am truly grateful for his understanding and patience. I also want to thank Roberto Visani, Associate Professor of Art, for his unfailing help with this project. And to Sam Tsao at Petzel Gallery, Scott Zieher at ZieherSmith, Silas Shabelewska at Art3 and Jack and Dolly Geary at Geary Contemporary.